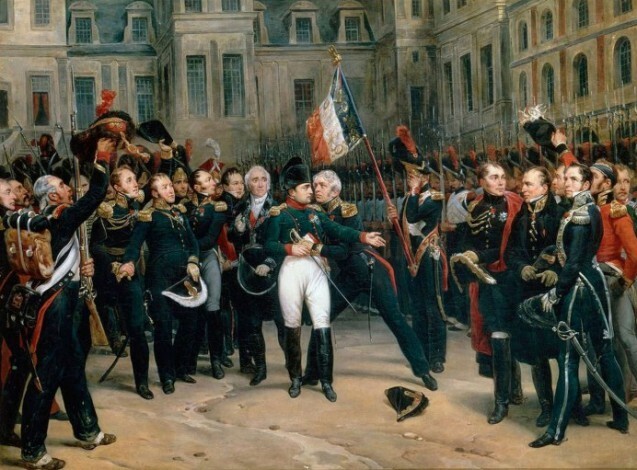 “On the 20 April at noon … Napoleon left his rooms… He descended the flight of steps [above the Cour du Cheval-Blanc, at Fontainebleau Palace] and, passing the row of carriages, he advanced towards the Guard. He made a sign that he wished to speak. Everyone fell silent, and in a most devoted quiet, they listened to his last words. Source: Baron Fain, Manuscrit de 1814, Paris: Bossange, 1830, pp. 251-2. “Soldiers of my Old Guard, I bid you farewell. For twenty years, you have constantly been by my side on the road to honour and glory. You have always behaved with courage and fidelity. Again in these last days, you have given me proof of this. In your hands, our cause would not have been lost. For three years I could have waged a civil war; but France would only have been more unhappy, there would have been no definitive outcome. The allied powers were presenting all of Europe united against us. One part of the army betrayed me; parties were created to form another government. I have sacrificed all my personal interests for the good of the nation; so I am leaving. You will serve her always with glory and honour; you will be faithful to your new sovereign.